Hungerford Bridge links London’s West End and South Bank. Built as a footbridge it was designed by Alex Lifschutz of Lifschutz Davidson. Opened in September 2002, the bridge spans both sides of the Charing Cross rail link across the Thames. Providing arguably one of the best night time river views of London looking East down the Thames, landmarks such as St Paul’s Cathedral, Tower 42 and the Oxo Tower can be seen in the distance. 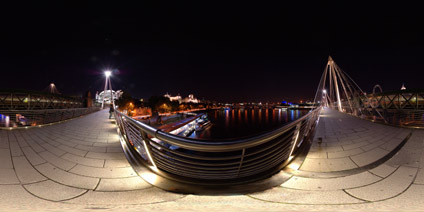 View the Quicktime panorama of The Hungerford Bridge, London (2.7mb).